Through my interviews for the Online Identity Project, I am getting a fascinating insight into what it means for different people to be authentic online: how they perceive their own authenticity, how they act authentic, and whether they think that true authenticity is even possible. As our offline and online lives intertwine, on social media, with cross-platform sign-ins, and while interacting perhaps on both personal and professional levels with others, the subject of authenticity arises more frequently. There have been many debates in the media (especially in relation to cyberbullying or identity theft) about what Personally Identifiable Information (PII) should be divulged online: legal names, date of birth, gender, location and many other details, are seen as signifiers of our authentic self. Businesses of course use this type of data to inform interactions with their potential customers, while online services require verifiable information for security, which is why more and more ‘authentic’ PII are required to sign up to apps and websites. With this in mind, could the way our data is collected affect how we present ourselves in online spaces? Could it change who we are online? When we’re online, we often speak to different audiences in different forums. On LinkedIn, we (most likely) want to look professional, skilled and knowledgeable. While crafting an online dating profile, we want to present our personal life in a way that will attract the attention of someone with similar likes and dislikes. On Facebook we might be interacting with close friends, exposing the occasional embarrassing moment. Each of these spaces might include varying degrees of authenticity, with tweaks to our identity depending on how we want others to see us. And while we nurture these different versions of ourselves, how much does this mirror our offline identity? I expected more of my interviewees to tell me that they communicate differently online to how they do offline. But many felt it was important to them to be the same person; to be themselves; to be true. Since the interviews for the Online Identity Project contain self-reported data, it is difficult to say whether these participants do actually act the same way online as they do off, or whether they only think they do. But none the less, it provides an interesting insight into the importance of being authentic and having authentic interactions with others in online spaces. For those interested in this topic, I have previously written about this subject in this post from 2014: The Authenticity Myth. I am seeking participants who are willing to share their identity-building experiences, either via email, or by chatting to me – online of course. To find out more about the project, or to participate, get in touch with me on social media or fill out the contact form here. 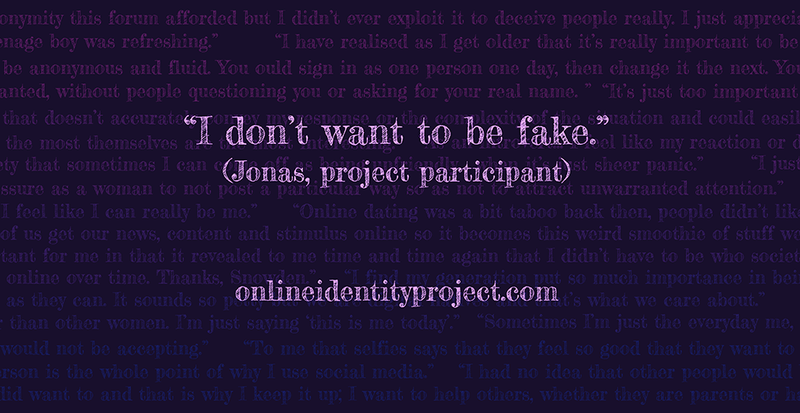 Read the stories so far at onlineidentityproject.com and follow the project on Twitter @WhoWeAreOnline.